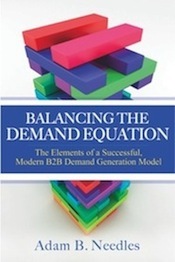 On September 19, my first book, Balancing the Demand Equation: The Elements of a Successful, Modern B2B Demand Generation Model, was released on Amazon. I can honestly say it was a very cool moment in my own personal and professional life, and I am thankful for so many who have helped make this project a reality over the past two-plus years. So nearly 30 days later, how’s it going? Literally, I wrote the book on B2B demand generation that I believed wasn’t out there — but needed to be! I’m thus happy to report that the book has been well-received by the very B2B marketing community it was written for, with strong early sales and some fantastic initial reviews. So given all that’s happened in the last 30 days, I thought I’d do a quick round-up and share some highlights, as well as providing an update on availability of the book. The simplicity of his approach is admirable. … It’s both strategic enough to help you think through the issues and tactical enough to help you actually do something meaningful to address them. Adam Needles’ new book Balancing the Demand Equation closes the gap. … Consider this a guidebook for how to play the game and win. I’ve been a fan of Adam’s for many years … he’s a master mechanic of modern marketing engines. … For the mere price of a book, it’s a bargain to tap into Adam’s experienced and inspiring thinking on these topics. And these write-ups come on the heels of some already strong reviews, highlighted on the back cover of the book, which I shared a few weeks ago. Again, I’m humbled, and my sincerest thanks to Ardath, David, Anand and Scott for taking the time to read and review my book. While I’ve had great luck with such fantastic reviews, I can’t say the same about the supply chain side of things. What can I say — and without getting into the details — is that within a very short time of my book being released, it was sold out and unavailable, and it took about two weeks to get back to a point where the book was consistently available via Amazon. The good news is that we’ve finally got things dialed with the printer, and we’ve been able to consistently keep the book available for the last week or two. I obviously want to apologize to anyone who had a bad experience getting early copies; hopefully, that will not happen again. So where can you get a copy of Balancing the Demand Equation at this point? Hardcopy: It is available in hardcopy format on both Amazon and Barnes & Noble. Perhaps the most exciting development over the first thirty days is that my book hit Amazon top-five bestseller status in more than one marketing category. All-in-all, a great first thirty days as an author. I’m really excited by how the book has been received so far, and I look forward to sharing it with more B2B marketers over the coming weeks and months. I also look forward to additional feedback as others read the book. Let me know what you think! Finally, thanks to so many people for supporting me in this endeavor. Writing a book is not a solo activity. I’ve acknowledged a number of people in the front of my book, but I want to once again say thanks to that group and to the broader network that has helped make this a reality.